I am trying to backup a new computer. The disk type listed on the computer is basic in the computer managment. I am getting the following error. E000202F4 Acronis Master Image Creator has detected unsupported hard disk drives. 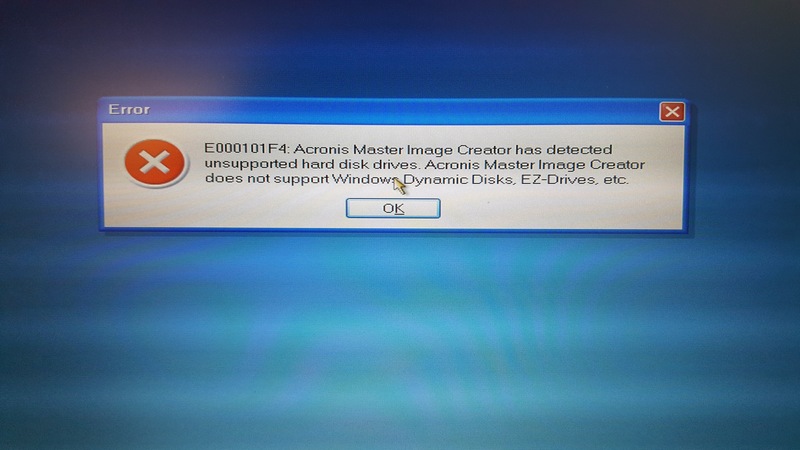 Acronis Master Image Creator does not support Windows Dynamic Disks, EZ-Drives etc. I am not sure why I am getting this error when the hard drive format is basic. I have also tried True Image 2011, it hangs up and does not do anything after i select to create a Master Image. Goes to a blank Screen. Just tried with Acrnois True Image 2016, it is stuck after selecting image creator, been like that for over 10 minutes. Can you screenshot the disk management view of the system you are trying to image and post for reference? Also, what type of system are you imaging. There were a couple of recent posts with people using ASUS motherboards that had a built in cache ssd and the default configuration is using RAID with the Cache SSD and another drive which is essentially a dynamic setup as well. ON both of those instances, the users had to break the raid, disable the caching drive and sent to a standard SSD to avoid this limitation and also benefied with the sperformance of using a standard SSD for the OS.